Philosophy – Zion Klos, Ph.D.
Overview: My research interests emerge from the pursuit of integrated basic and applied questions at the overlap of hydrologic, geologic, ecologic, and human systems. I pursue community-level outreach in an effort to share current and evolving science to help others make informed decisions within our society. My goals in teaching are to foster the next generation of critical thinkers that not only have a strong base of knowledge in the sciences, but also have the skills to learn and acquire new information independently or collaboratively as they work to solve fundamental questions facing society and our environment. I am constantly seeking to expand creative, interdisciplinary research avenues and experiential pedagogies that explore complex systems using integrative problem solving and thinking across disciplines. Why and How: Increasing anthropogenic pressures, such as climate change, threaten the resilience of coupled human-natural systems worldwide. Water is a key resource within many of these systems; therefore, the hydrologic community needs to be increasingly ready to take on integrated challenges at the interface of hydrology and humanity. The resilience of these systems is dependent on informed individuals to make sound decisions that reflect the reality, and the science, of the situation, while not being alienated from the process of scientific investigation. Increases in education, research, and outreach – and more importantly synergistic and interdisciplinary learning using a combination of all 3 – are needed to advance the state of this integrated knowledge (Fig. 1). The future of our environment is dependent on the ability of the scientist, or student, to effectively ask these integrated questions that are most relevant to society, while also not leaving the individual’s interests aside and loosing the personal motivation necessary to be engaged with their work (Fig. 1). To meet this challenge and to help others find their own overlap, my goal as an educator is to foster the next generation of critical thinkers that not only have an interdisciplinary base of information in hand, but also have the skills to learn and acquire new information independently or collaboratively as they work to tackle the future of big problems within our society. I am constantly seeking to expand creative, field-intensive experiential pedagogies that explore relations between natural sciences and society using integrative problem solving that bridges thinking across disciplines. Fig. 1: My goal for an integrated career in education-research-outreach at the overlap of hydrologic interest and social relevance. 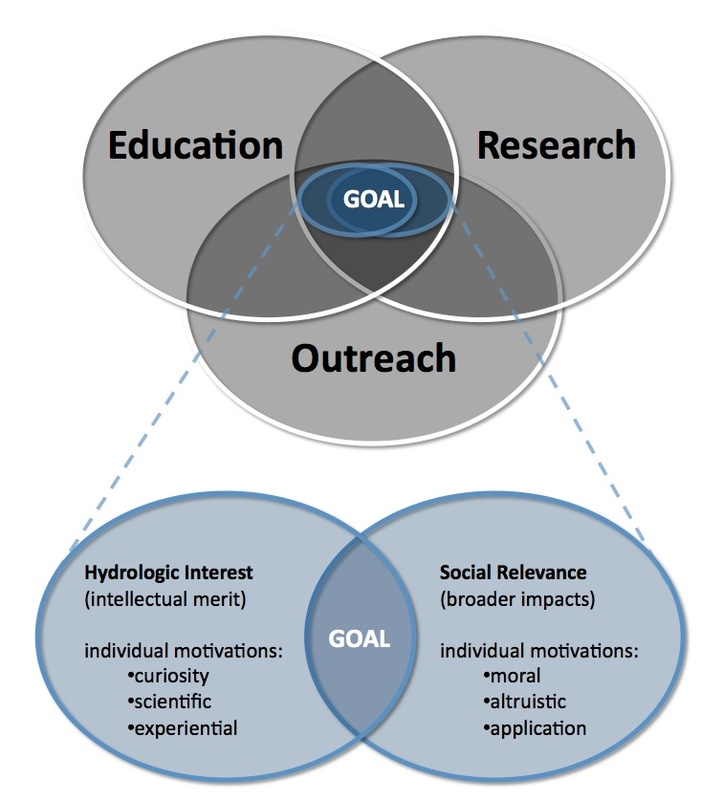 Figure 1 highlights this conceptual merger of a career that strives for the strongest overlap of education-research-outreach AND hydrologic interest with social relevance. I believe hydrologic interest in many individuals is often motivated by: 1) intrinsic curiosity about a particular question, or mystery in the subject matter, 2) scientific interest, with the greater scientific community often coming together to foster the cutting-edge questions within the discipline, and 3) experiential motivations, which generally reflect an enjoyment for the experience (e.g., fieldwork, travel, research tools). While furthermore, social relevance may be motivated by: 1) moral obligation, feeling that one’s skills need to be utilized to accomplish the ‘right’ thing, 2) altruistic motivations, the unselfish desire of doing something more to help others on a larger scale, and 3) motivations surrounding the application of the work, such as the fulfillment of seeing something tangible occur as a result of the scientific findings. Conceptually, this is similar to the merger of intellectual merit and broader impacts that is integral to the NSF’s philosophical perspective. Through combined research, education, and outreach, this coupled philosophical perspective – aiming for the optimal overlap of hydrologic interest and social relevance – may be pursued personally and fostered extrinsically in the next generation of integrated thinkers.